We’ve seen this countless times. Every time an asset class or sector captures the imagination of the masses, Wall Street rushes in with new specialized products. This is so common it has a maxim: “when the ducks quack, feed them”. The last time I mentioned a similar product (Claymore Gold ETF) was this summer when gold was trading at $981. It didn’t see that level again until September. The S&P 500 Gold Hedged Index is calculated as a combination of a long S&P 500 position overlaid with a long position in COMEX gold futures. The hedge only protects against adverse movements in the relative value of the U.S. dollar, as expressed in the dollar price of gold. Stock market risk is not hedged in any way. The results of a gold-hedged index strategy, versus that of an un-hedged strategy, vary depending upon the movement of the gold futures contract and the U.S. dollar. 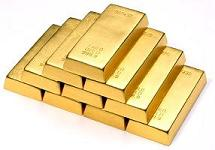 By holding long gold futures contracts, investors may gain when the U.S. dollar loses value as expressed by gold. Conversely, they may lose when the opposite occurs. Even if we ignore this most recent one, there have been several unmistakable signs of a top: gold going parabolic, gold’s Commitment of Traders report showing a crowded trade and gold sentiment being very very bullish. As well, gold has now reached 32% above its 350 day moving average. 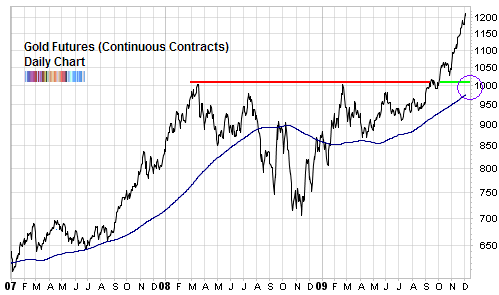 The 2006 top came after it reached +40% and the 2008 top at 38%. While it is true that we are in a bull market for gold, indiscriminate buying based on emotion, rather than logic would make this like any other bubble we’ve seen before. And if you expect China’s central bank to continue to propel gold vertically, think again. So expect gold to have major support when it does drop, but expect a drop. A return to test the significant $1000 level would convert that price point from long term resistance to long term support. It would also coincide with the rising long term support from the 200 day moving average (now at 975). But, what is critically important when comparing the last three moves up for the gold price is to note the scale on the chart. For example, some quick math reveals that the 2005-2006 move from just over $400 an ounce to $725 was a gain of some 70 percent and this occurred during a relatively calm period when central banks were still selling their gold reserves as fast as they could and the entire world still thought it was getting rich due to rising asset prices. The 2007-2008 jaunt from the high $600 range to just over $1,000 was a surge of about 50 percent which took a few months less to accomplish than the prior move. This occurred when there was growing fear of inflation but the sustainability of the global financial and monetary system was not being widely challenged as it is today. I’m not really sure I understand your position here and I think that is because of the conflation of the term “bubble” with something that is probably just extremely overbought in the short-term. When I think BUBBLE, I think multi-year or even 1-2 decade top like gold in 1980 or the Nikkei in 1990 or the NASDAQ in 2000 or Las Vegas housing in 2006 (most likely). Is your position that $1200 right here, right now is going to be a multi-year top? If not, then it isn’t a bubble. As the author in the note above points out, we’ve only moved up about 20-30% in this upleg from the breakout level. The last 2 uplegs were 70% and 50%. That said, my instincts tell me we are at or near what will be just a very short-term top. I don’t think it corrects to $1000. It isn’t going to let you back in that easy. It will fall enough to shake out the Johnny come latelys but not enough for people who sat on the sidelines when it broke out in September. 1100 is the bottom of the trend channel. I am considering selling half here with the idea of buying that half back at 1100. I do think this has a good chance of becoming a full-fledged bubble in which case I’ve noticed that bubble peaks tend to triple off the base of the final break-out which gets you to $3000. Mike, when I use the word ‘bubble’ I mean a small bubble not a bubble in the tulip mania sense or the Tech bubble of 2000. I think that while gold is in a secular bull market, right now it is at a short term top. Or very close to it, making new money put to work at this level too risky. re: financial meltdown and gold prices: In 2007-2008 the writing was on the wall. It was being talked about extensively on financial forums with investors chanting ‘buy gold’. At that time, a lot of people knew capital was being injected into some major banks by the government and asset firesales were occurring. Even though most didn’t have an understanding of the CDO market, the symptoms of the meltdown were being noticed widely.